International businesses perceive Ireland to be more corrupt than Uruguay, Chile and the Bahamas. Ranking could have impact on Ireland's credit rating. A global index measuring perceptions of corruption in 176 countries gives Ireland its worst ever ranking and suggests that corruption is a bigger problem here than in some developing nations including Uruguay and the Bahamas. Ireland is now ranked in 25th place in the Corruption Perceptions Index conducted annually by Transparency International (TI). The worst performing countries are Afghanistan, North Korea and Somalia. Denmark, Finland and New Zealand are perceived to be the least corrupt countries of those surveyed. The index is one of the most commonly used measures of political risk and is used by credit risk agency Standard and Poor’s to assess the likelihood of sovereign debt default. According to John Devitt, Chief Executive of TI Ireland, ‘If investors believe government decisions are being swayed by political or private gain, it could have a harmful effect for our economic recovery. Small, open economies are much more exposed to reputational risk than their more powerful counterparts. Risk-averse and politically aware investors will also look elsewhere when deciding where to locate or do business if they suspect that favoured businesses and government are in bed with one another’. The poor results come after a succession of political controversies. The Moriarty and Mahon Tribunals published negative findings against politicians and business people after 15 year-long investigations into corruption and payments to government ministers. There was further controversy a year after the publication of the final Moriarty Tribunal report when the Taoiseach shared a platform at Wall Street with Denis O’Brien, a leading businessman linked to clandestine payments to the former minister for communications, Michael Lowry. Mr Lowry was found to have influenced the award of the second mobile phone licence to Mr O’Brien’s consortium in 1995. ‘Ireland’s ranking shows how little faith investors have in our ability to prevent the abuse of power. Our failure to hold people to account for wrongdoing is also having a negative impact on international perceptions of Ireland. There appears to have been very little action taken on foot of the publication of the final Moriarty Tribunal report, while The Taoiseach’s decision to make public appearances with Denis O’Brien after the publication of the report will have done our international reputation no favours’, said Mr Devitt. TI Ireland recently published a European Commission-sponsored report which acknowledged the progress the Irish Government had made in reforming corruption law and ambitious plans to protect whistleblowers. However, the anti-corruption group has warned against delaying further commitments to clean up public life. It has also highlighted the Government’s failure to implement reforms aimed at promoting transparency in the public sector and sharing more power with the Oireachtas. ‘We will still attract companies looking to avail of our low tax rate, but our reputation for cronyism and other forms of corruption will drive many honest businesses towards more open and well regulated economies’, Mr Devitt added. 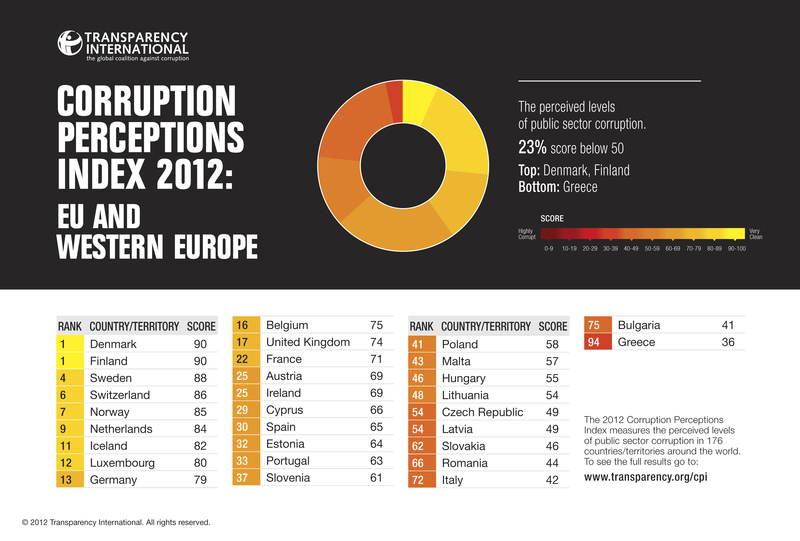 This year Transparency International has updated the methodology for the Corruption Perceptions Index 2012. To reflect this, the Corruption Perceptions Index is presented on a scale from 0 (highly corrupt) to 100 (very clean). The change in methodology is not believed to have significantly impacted on Ireland’s ranking or score. This year’s index ranks 176 countries/territories by their perceived levels of public sector corruption. The index draws on 13 surveys covering expert assessments and surveys of businesspeople. The Corruption Perceptions Index is the leading indicator of public sector corruption, offering a yearly snapshot of the relative degree of the corruption problem by ranking countries from all over the globe. A 2008 Pricewaterhouse Coopers survey found that 45 per cent of businesses have been deterred from investing in a country because of its reputation for corruption. TI Ireland estimated in 2009 that Ireland could be losing €1 billion a year in foreign direct investment because of its relatively low position in the Corruption Perceptions Index. Ireland has slipped 11 places in the index since then. In 2011, Ernst & Young reported that a ‘significant number’ of Irish professionals believed it was acceptable to win business by using inducements. The Ernst & Young European Fraud survey found that ‘over a quarter of all senior managers and over a third of employees confirmed that activity including offering personal gifts, offering free entertainment and even offering cash payments was acceptable in order to win or retain new business’. According to the Eurobarometer survey for 2012, 86 per cent of Irish people said corruption is part of Ireland’s business culture, compared to the much lower EU average of 67 per cent. The International Monetary Fund has identified a link between unfettered influence brought to bear on the regulation of financial services and the current international financial crisis. It found a statistical correlation between lenders who engaged with policy-makers most intensively on issues of mortgage lending, and those who were most negatively affected during the current crisis. These lenders had looser lending standards measured by loan-to-income ratio, greater tendency to securitise, and faster-growing mortgage loan portfolios. The authors of the IMF report concluded that preventing a future crisis might require weakening the political influence of the financial industry or greater transparency in how public policy is influenced.